I took a week and a half off from posting due to the fact that my husband and I bought our first house a couple of weeks back, and we finally moved in last weekend. Yesterday was the first time I was able to get out of the house with my camera in weeks, and even then, it was a rushed journey. The rain was due to arrive around 1pm, and it did, just as we loaded back into the car. I am glad I was able to get out and capture some of the autumn sights, including this macro of a frayed mushroom amongst the fallen leaves. Beautiful photo, I had a similar situation with the rain, but without photos. I do hope you'll add a "patch" to this year's gratitude word quilt… instructions for how to participate are at the top of my blog. It is very simple, just takes a few breaths and a moment or two to write then send to me in an email. Congratulations on your new house! This is a great-looking macro. 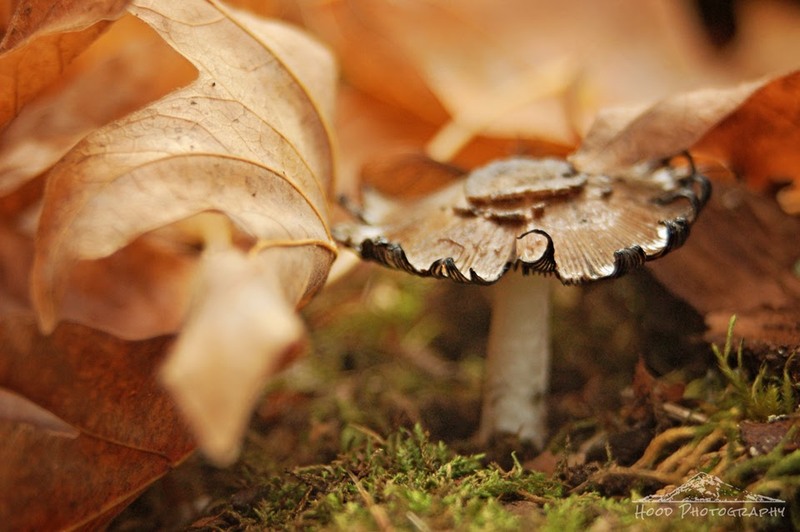 I love the lighting, the way the leaves frame the mushroom, and the delicate, frayed, black edges. Great photo ! Congrats on your new home ! Have a good week ! Beautiful shot! Congrats on your new house. Dainty little loops on the edges of the mushroom. Nature is beautiful even when winding down in the fall. Congrats on the new house. Great capture! I love that black little curl in the front of the mushroom.